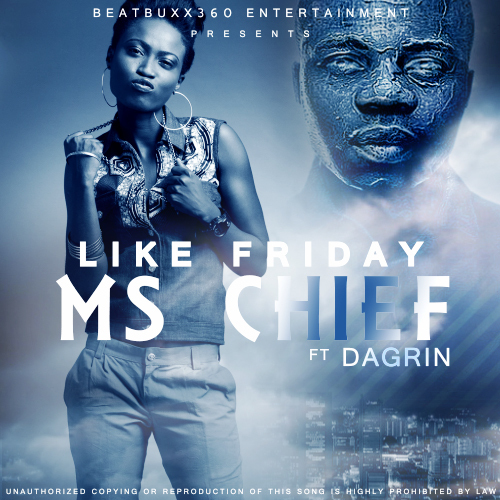 We are proud to present to you ‘Like Friday’ by Ms. Chief featuring Da Grin. The song which is reminiscent of Beyonce’s ‘Party’, is sure to make you bump you head and burst a move. From all indications it seems ‘Ms. Chief’ is not slowing down anytime soon. A few weeks back, her single ‘That Girl’ which featured E.M.E recording artiste and superstar ‘Wizkid’ impacted the airwaves and is still going on strong. Now the female mic-wrecker handled by BeatBuxx360 Entertainment shocks us again with an exclusive collaboration with the late Nigerian rap legend “Da Grin” on a juicy ‘Dre Sticks’ crafted instrumentation.